Nelspruit to Cape Town flight bookings qualify to earn travel vouchers - simply email a review of your trip to cheapflights@southafrica.to and we will send you travel vouchers (better reviews earn more). The Kruger and the Cape are the big 2 destinations for foreign tourists in South Africa (the other of the big 3 in southern Africa, is the Victoria Falls). Unfortunately this is one of those routes where a price war hasn't broken out between SA Express and SA Airlink, and it's only Airlink operating direct flights from Nelspruit to Cape Town. Your alternatives are to do a 1-stop via Johannesburg, or what I usually do is drive from Nelspruit to Johannesburg, and then fly from Johannesburg to Cape Town). SA Airlink operates daily flights, which are scheduled to leave Nelspruit at 13h15 and all going well, land in CPT at 15h55. SA Airlink flights to Cape Town from Nelspruit are scheduled to take 2 hours and 40 minutes, and are flown in Avro RJ85 Avroliner (AR8) jets, which seat up to 112 passengers. Baz Bus operates a hop-on hop-off bus tour across South Africa, and is especially popular amongst backpackers, stopping off at 180 youth hostels along its route. On your way from Nelspruit to Cape Town you can stop off at Manzini, Durban, Umtata, East London, Port Elizabeth, Plettenberg Bay, George and many other towns. This is the usual route to drive, via Johannesburg. 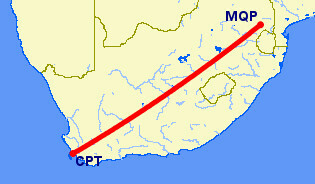 It's 1762km from the Kruger Mpumalanga International Airport to Cape Town International Airport, and takes some 17 hours (probably a good idea to stop somewhere along the way, rather than doing it in one stint). There are a number of companies offering Cape Town shuttle services.